Meet Popular Girls: Violet and April Brinson! 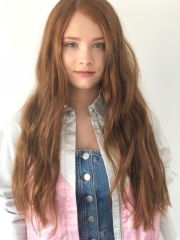 Dynamic sisters Violet and April Brinson are the most electric talents to storm into Hollywood and are forces to be reckoned with as they star in the critically acclaimed “Sharp Objects. 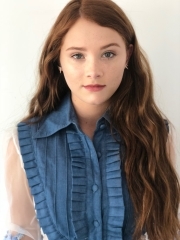 This year will surely be noted as the breakout year for both April and Violet Brinson, Violet has already worked with Academy Award nominated director Darren Aronofsky on an upcoming vaping PSA which is due out later this year and she was also cast on the CBS pilot series “Cagney & Lacey” as the young Cagney. 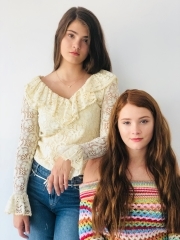 Previously, April appeared in the long-running CBS crime drama “NCIS.” Violet and April have also appeared together in the sci-fi action adventure film THE VEIL. We caught up with Violet and April Brinson and asked them some of our exclusive questions. Tell us about your show Sharp Objects and your characters? Violet: Sharp Objects is about an investigative reporter, played by Amy Adams, who comes back to her hometown to investigate the murders of two young girls. My character Kelsey is best friends with Amma (Camille’s half-sister) and Jodes. Amma, Kelsey, and Jodes are a tight knit trio, often seen roller skating around Wind Gap, stirring up trouble. April: Sharp Objects is about an investigative reporter, Camille Preaker, who returns to her hometown to investigate the murders of two teen girls. My character Jodes, is best friends with Kelsey and Amma. She is more sensitive and at the bottom of the pecking order within their trio. In what ways are you and your character’s similar? Violet: Because of my tight relationship with April and my friendship with Eliza, I feel that same camaraderie and closeness with them that Kelsey feels for Jodes and Amma. However, I feel our relationship is rooted in love and support for each other where Kelsey, Amma, and Jodes relationship does not come from this same place. I have also had experiences within friend groups where you feel the pressures of fitting in and wanting certain people to like you. However, I’m a rule follower whereas Kelsey is not. She likes to get into trouble and stir things up a bit. In my real life, I could never even dream of getting into half of what Amma, Kelsey, and Jodes, get themselves into. April: Just like Jodes I have been in difficult female relationships. Throughout filming, I really had to identify with the moments in my life where I have felt less than or unwanted. I also had to find the desire to please Kelsey and Amma even though they continued to treat me poorly. Jodes tries hard to fit in with them, just as I have tried to fit in to groups that don’t have a positive impact on my life. Overall, Jodes is the complete opposite from me. We all have multiple side to us that we don’t always share with the world or would never act on, so being able to play a wild child on set for several months was very liberating. I could express all of those darker sides of myself in a safe environment. Violet: Oh, it’s a blast! April and I are very close and getting to experience this with her by my side has been fabulous! It’s nice having someone who will never get tired of hearing the same stories from filming over and over again. April: When we found out we were actually going to work together we were beyond thrilled. We found out while we were at lunch together and we couldn’t stop laughing. We would calm down for a minute and then the second one of us tried to process that we were going to be on set we would start laughing again. This antsy excitement lasted for months; I loved every scene I got to be in with Violet. It was so nice to have an unwavering support system to bring on set with me every day. What is it like acting in a murder mystery? Violet: It’s a lot of fun. Being on this side of the whole “whodunit?” thing was so amazing because I’m so often on the other side, watching a TV show, desperately trying to figure out who the killer is. April: Ummm awesome! There are so many secrets in Sharp Objects that the audience gets to uncover as the show progresses. I love knowing something our viewers don’t and being a part of their journey to finding the truth. April: It changes constantly, but I love Pulp Fiction right now. Violet: Ooooh!! This is so hard. I love Westworld, but right now I’m binge watching Bates Motel. April: Castle Rock, but seriously can’t wait for Game of Thrones to come back. Violet: Some super duper comfortable striped jeans from AMO that I am obsessed with. Violet: I’m going to name four people, hahaha! J.R.R Tolkien, Malala Yousafzai, Boris from The Goldfinch, and Paul Rudd, because he seems like a cool dude. Violet: Making baked goods disappear. Violet: Once during a game of Trivial Pursuit, I was asked how many states there were in the United States… I said fifty-six. April: I finger painted our white cat and swore up and down it was my sister Violet. Violet: Popular to me, means whatever it is that you love and are passionate about. It’s being proud of who you are and being grateful for all the miracles and possibilities in your life. April: To me popular means loving yourself and being confident and comfortable in your own skin. 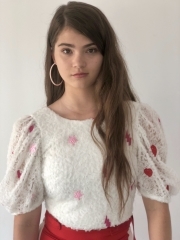 Violet: I can’t say anything at the moment, but I’m very busy with work and auditions and can’t wait to talk about these opportunities in the future. April: Nothing I can talk about right now, but I hope I get to update you in the near future.